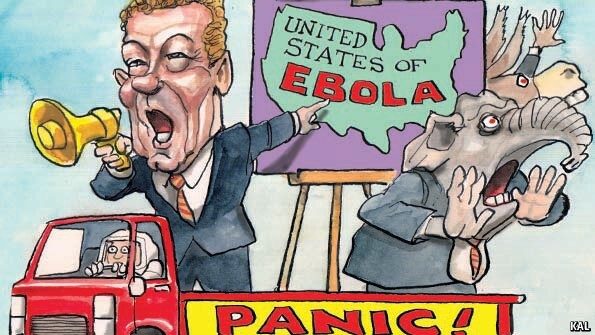 IN THE crowded field of Ebola alarmists, Rand Paul of Kentucky stands out. Before he was a Republican senator with presidential ambitions, he was an eye doctor. Apparently the Hippocratic oath does not cover panic-mongering: Dr Paul has popped up on talk-radio shows, alleging that when Barack Obama or his scientists say that Ebola is rather hard to catch, they are fibbing. Or, as he puts it, they are downplaying the risk that Ebola might spread across America for reasons of “political correctness”. Ebola is “incredibly transmissible”, Dr Paul has asserted, talking of doctors falling sick even after they suited up and took “every precaution”. No one is denying that Ebola is a huge problem in Africa, nor that it would be a disaster were it to reach and spread through the slums of say, Mumbai. But rich nations have the resources to contain it if it reaches their shores. America has so far seen one case: a Liberian man who died on October 8th. Although a Texan hospital at first missed his symptoms, he was subsequently isolated and is not yet known to have infected anyone else. Also on October 8th, the federal government announced that passengers from West Africa would be screened for Ebola at five American airports. Many politicians are demanding more drastic measures. Dr Paul is one of several to ask why flights from Ebola-stricken African countries to America continue at all. Governor Bobby Jindal of Louisiana says planes must be grounded “to protect our people”. Senator Ted Cruz of Texas contrasts Mr Obama’s willingness to let airlines serve West Africa with July’s “highly suspicious” decision by the Federal Aviation Authority (FAA) to halt American flights into Israel after a rocket fell near that country’s main airport, just as the government was—Mr Cruz growls—pressing Israel to grant concessions to Hamas. Many candidates have urged Ebola travel bans. Few mention that most routes from Africa to America require transfers in Europe, making it hard to stop them without closing the Atlantic (see article). Government doctors are working to calm the public, notably Tom Frieden, head of the Centres for Disease Control and Prevention, and Anthony Fauci, boss of the infectious diseases arm of the National Institutes of Health. The pair have spent hours on TV, enduring hosts shouting about “hot zones”, or enquiring whether terrorists might use Ebola. (It would be an “inefficient” bio-weapon, Dr Fauci mildly replied, adding that the virus’s evolution in nature is far scarier.) Repeatedly the pair have explained why quarantining West Africa would be unwise. It would weaken governments, hobble aid, trap Americans and spur travellers to move in roundabout ways that make them harder to track. To be fair, Democrats have also played virus-politics. The first Ebola attack ad ran in August, as Senator Mark Pryor of Arkansas accused his Republican opponent, Tom Cotton, of voting against a pandemic-prevention bill (neglecting to mention that Mr Cotton later voted for a different version of the same bill). Democrats have linked the Ebola crisis to the sequester, across-the-board federal spending cuts which reduced public-health funds and overseas aid. True, Congress has spent years messing up science funding, but that is not why Ebola exploded in Africa. Indeed, America has poured billions of dollars into pandemic preparedness since the 2005 Asian outbreak of H5N1 avian flu. The country is “dramatically better-prepared than it was”, says Michael Leavitt, George W. Bush’s health secretary during the bird flu scare. A new poll by the Pew Research Centre shows how tribalism skews trust. With Mr Obama in the White House, Republicans are much more sceptical than Democrats about the government’s ability to prevent a big Ebola outbreak, Pew found. In contrast, in 2005 Republicans were far more confident than Democrats that Mr Bush could control bird flu. Yet distrust has also mutated like a virus in recent years. America’s debate on Ebola is, or should be, an argument about the best use of the country’s formidable resources. Namely, is it safer to pursue hermetic isolation from the world; or (counter-intuitively) is it less risky for America to fight Ebola with a strategy of controlled openness, leading a global fight to beat the virus at its source, while trusting experts to prevent an American outbreak with painstaking health-checks at airports and hospitals? That sort of argument will always expose philosophical differences. Reasonable people will often disagree: some instinctively put their faith in security, others in openness. It is good to ask hard questions about official competence—agents of state authority often make mistakes. 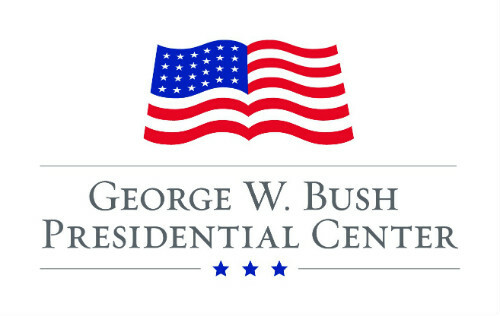 And there is nothing new about a crisis stoking partisan flames: in 2005 the far left accused Mr Bush of failing to respond properly to Hurricane Katrina because he supposedly did not care about black residents of New Orleans. But the arrival of a nasty virus from Africa has revealed something else. Ambitious politicians are no longer merely attacking the other party, or the president. The starting point for Ebola alarmists is an assumption that behind policy disagreements, conspiracies lurk, with technocrats in on the plot. Dr Paul appears to believe that officials are knowingly lying when they downplay the risk of a pandemic. Mr Cruz breezily suggests that the FAA helped to bully Israel. Louisiana’s governor complains that the government, in arguing that flight bans do more harm than good, wants Americans to heed what he sniffily calls “the experts”. Some leaders are more responsible. The Republican governor of Texas, Rick Perry, has tried to keep people calm. Few countries are better equipped than America to keep the public safe, he has assured Texans. He is right. It should not need saying. 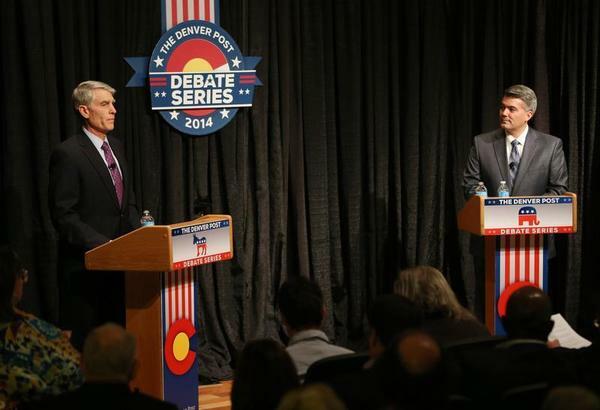 Hispanic Voters in Colorado: Energized or Apathetic?